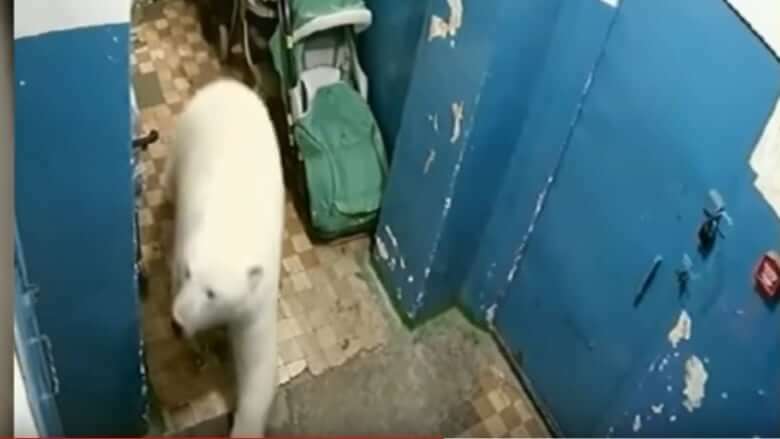 Just a few years ago, polar bears ventured into a Russian weather station scaring scientists, and now again, approximately 50 of the predators invaded a remote Russian town – a state of emergency had to be declared. According to CBCNews, the bears invaded residential areas including an apartment building in Belushya Guba, a Russian military community of 2,500 people on the far northern archipelago of Novaya Zemlya. 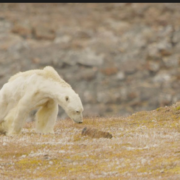 Although it is not unusual for citizens to see polar bears in the High Arctic region, the bears have become more brazen – including attacking people, entering residences and office buildings and have been roaming around the area since December. “People are scared, afraid to leave the house, their daily activities are disrupted, parents are afraid to let their children go to schools and kindergartens,” a deputy school administrator posted in a press release. 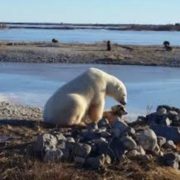 More fences and barricades have since been installed, but it isn’t unusual to see 20 to 30 polar bears scrounging around the garbage at the town dump. And the scariest part – the bears are not afraid of anything. Polar bears are classified as endangered in Russia and the federal government forbids an anyone from killing the animals. The movement of the bears has been related to the shrinking Arctic ice. Polar bears rely on the sea ice to hunt, but the melting ice drives them to land to hunt for food. Marine ecologists have repeatedly sent out warnings concerning global warming and the consequences for certain vulnerable species – the polar bears. Now the bears could be slaughtered if Russian officials don’t figure out a way to keep these endangered animals from attacking humans. Photos and videos recently posted show the bears appearing everywhere – including playgrounds, at dog parks and in apartment buildings. Humans are the reason their habitat is shrinking. Who can blame these beautiful creatures for what they’re doing to save themselves? Not me. I feel sorry for them. Please spread the word to Change.org, The Greater Good network and as many animal help networks you can think of. Something must be done SOON to save these amazing creatures! Why doesn’t a wildlife organization build a sanctuary for these bears since they’re unable to get food where their usual habitat is for whatever reason…with all the billionaires in the world, one would think this is a problem that can be resolved and eliminate suffering. Get over the greed and ego..help these guys! I love your idea about the sanctuary! Poor bears are starving! Why not help them? Stop cutting down all the trees all over the world, also start using hemp products for the environment instead of plastic. look at all that trash in the picture, I feel bad for those polar bears. Putin will hopefully have the officials lure the bears away with food and then hundreds of km’s away give them each 1000 of the remaining farmed salmon. Helping the bears and ending the farmed fish dilemma.